Phra Pidta Kanok Kang of LP Toh, Wat PradooChimPlee, was made in B.E.2522. Approximately 10,600 pieces are made of black Bailan and 1,500 pieces are of yellow color. The black pieces were inserted with one or two Takrut at the bottom but none for the yellow color. It's rather rare to find the yellow item which is 4-5 times more expensive than the black item. There are a lot of fake pieces of yellow color in the maket. Some fakes may insert Takrut at the bottom. 1. Neu Phong Kasorn (yellow batch), no takrut and made 1,500 pieces. 2. Neu Phong Bailarn (greyish batch), there are one or two takrut and made 10,000 pieces. There are less than 4,000 pieces with two takrut. - Phim Kammakarn Neu Phong Kasorn with gold takrut and silver takrut, and made only 5 pieces. - Phim Kammakarn Neu Phong Bailarn with gold takrut and silver takrut, and made only 100 pieces. - Phim Kammakarn Piset with two pieces of gold takrut and made only 40 pieces. 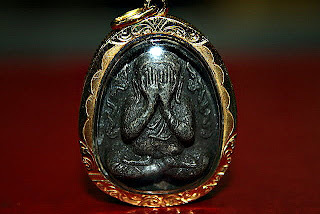 Phra Pidta Kanok Kang, black color. One or two Takruts were inserted at the bottom. Pidta Kanok Kang, consecrated by Luang Pu Toh, Wat Pradoochimplee in B.E.2522, where "Kanok" refers to a cultural Thai design of golden silk to represent flames and "Kang" means side or flank. Hence, the meaning of Pidta Kanok Kang is "Flames beside the image of Phra Pidta". Luang Pu Toh made this batch of Pidta Kanok Kang amulets for Chok Lap (good fortune). The consecration was done by placing the Phra Pidta amulets on the altar in the temple, amidst candles and by tying of Sai Sin (holy threads) between the holy candles and amulets. Upon an auspicious hour, the consecrated candles (Thian Chai) were lighted and Luang Pu Toh chanted over these Phra Pidta consecutively. The candles were tilted to let the candle wax drip on the Phra Pidta amulets so as to bless these Phra Pidta amulets with the "flames". When the hot wax dripped on the Phra Pidta, the fire that dripped along were miraculously extinguished and the amulets did not catch fire. This was witnessed by many spectators and after the ceremony, Luang Pu Toh distributed these Phra Pidta amulets and blessed the people who now owned this batch of Pidta Kanok Kang. Subsequently, the people who were present during the ceremony and were given this batch of Phra Pidta Kanok Kang, came together after sometime and discussed their experiences. Many experienced "Kleaw Klaad" (free from danger) and "Metta Mahanyiom" (extremely good relations with others). This batch of Phra Pidta is highly sought after by people who believe in the miracles of Luang Pu Toh. Nur Phong Bailan (burnt palm leaves) made 10,000 pieces, where less than 4,000 pieces are of 2 silver thakrud. Nur Phong Kesorn (jasmine flower pollen) made 1,500 pieces, where no thakrud was inserted. 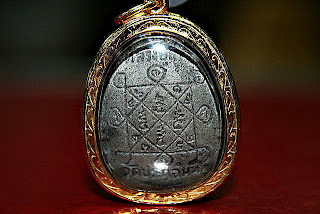 Nur Phong Kesorn, made 5 pieces, where 1 gold and 1 silver thakrud was inserted. Nur Phong Bailan, made 100 pieces, where 1 gold and 1 silver thakrud was inserted. Phim Kammakan Piset (special committee mould) Nur Phong Bailan, made 40 pieces, where 2 gold thakrud were inserted. "Phra Pidta Kanok Kang, LP Toh, Wat Pradoochimplee B.E.2522"? Nur bailan with no tangka is fake?